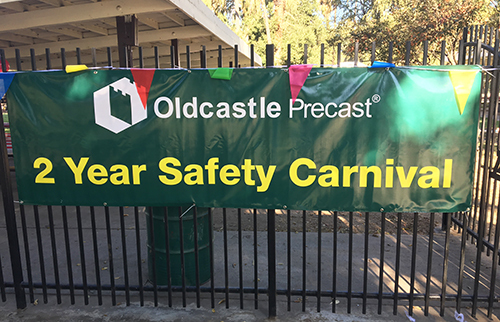 Another perfect year for employee safety for Oldcastle Infrastructure Perris, which operates one of Oldcastle’s prestress/precast manufacturing plants. The companies approximately 50 employees combined to work roughly 927,429 without any Occupational Safety and Health Administration (OSHA)‐recordable. Due to extraordinary safety efforts, the Oldcastle Infrastructure Perris team surpassed the two‐year safety milestone on October 15, 2017. Maintaining the highest standards of safety for our employees, as well as our customers and communities, is our top priority at Oldcastle Infrastructure. It’s essential in potentially hazardous work environments like ours, and every employee is dedicated to putting safety first. Recognizing the team’s hard work and dedication to safety, employees and their families were treated to a day of carnival games, jump houses, face painting, and of course lots of catered food. Each employee was given a commemorative jacket and small pocket knife in honor of their pursuit of safety excellence.